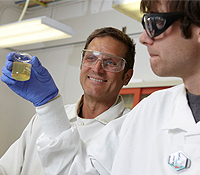 Chemistry professor Kenneth Czerwinski works with a student during Radiochemistry Fuel Cycle Summer School. UNLV’s radiochemistry program is partnering with the University of California, Berkeley and a consortium of universities and national laboratories for research and development in nuclear science and security. The consortium is supported by a five-year, $25 million grant from the U.S. Department of Energy’s National Nuclear Security Administration (NNSA). This is the second round of funding for UNLV as part of the Berkeley-led team. Radiochemistry professors Frederic Poineau, David Hatchett, and Ken Czerwinski lead UNLV's research team on the grant. According to Czerwinski, the university will receive close to $2 million over the next five years to advance research on nuclear forensics. The team will investigate and broaden our understanding of specific groups of radioactive elements and train students to properly handle and examine radioactive samples.